Combine all the seasonings together until well incorporated. Rub the spice mix all over the pork shoulder. In a pan, heat vegetable oil. Add the pork and cook until browned on all on sides. In the slow cooker, add onions to bottom. Remove pork from frying pan and add to slow cooker, including all the liquid and oil. Add remaining ingredients: tomato paste and vinegar. For the homemade BBQ sauce: While pork cooks, make a simple homemade BBQ sauce by combining all the ingredients. Mix until well incorporated. 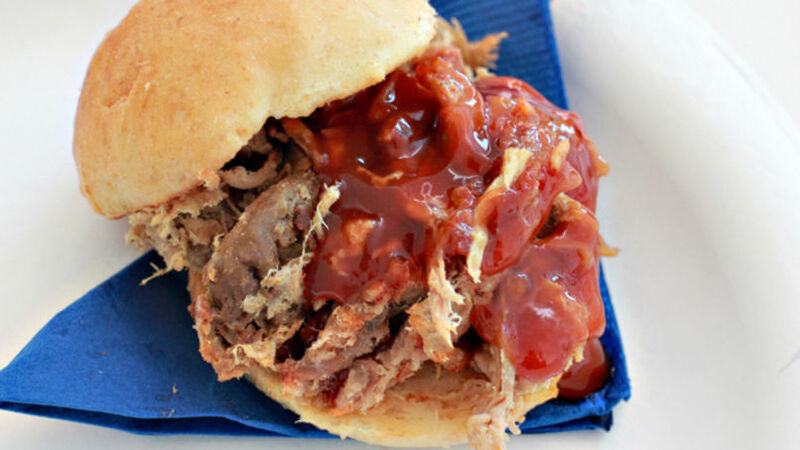 Add a heaping spoonful of shredded pork on the bottom half of the bun and pour homemade BBQ sauce on top to taste. Top with other bun and serve. Use your favorite hamburger bun to soak up the flavors. As the weather warms up and your schedule gets hectic, the slow cooker becomes mom’s best friend to make value rich meals. At least for me, this slow cooker pork sandwich recipe is the perfect weeknight meal. It’s filling, but not costly, and brimming with flavor. Top with a simple homemade BBQ sauce, and you will like a super mom.